I send this out to my department each Friday; we do it for the laughs over how song lyrics can be really misheard. I thought maybe some other people would enjoy it. The first section gives 10 songs with what people THOUGHT were the lyrics. They’re different styles of music and different decades, so some will very easy for you and others will be songs you never heard of. Scroll down for the answers: they give you the song title, the artist, the real and misheard lyrics, and finally the story from the person who misheard it. Swingin’ Logs in the backseat. I miss Alexandra once again and I think I’m in. You can bite your hair if it won’t grow. You can pick your nose if he says so. We didn’t fart, you liar. …Turned to Wyatt Earp, ashamed and pale. Real lyric: Singin’ songs about the Southland . I miss Alabama once again and I think it’s a sin. Misheard: Swingin’ Logs in the backseat. I miss Alexandra once again and I think I’m in. The story: I felt so stupid. The story: I thought maybe it was about a STD, but I knew that couldn’t be it. Real lyric: You can buy your hair if it won’t grow. You can fix your nose if he says so. Misheard: You can bite your hair if it won’t grow. You can pick your nose if he says so. The story: There’s probably nothing more embarrassing than convincing people you knew in high school that your lyrics were correct. To my credit, though, TLC sings this song so low and so fast that it’s very hard to determine what they’re actually singing. God, I love my lyrics though, despite the laughter that ensued from my classmates. I’m sticking to my story. Misheard: Ride a painted toenail…. Real lyric: We didn’t start the fire. Misheard: We didn’t fart, you liar. The story: My wife and I told our kids those were the real words when they were about 10 years old. They know better now, but, we still sing it that way! Real lyric: …Turned a whiter shade of pale. Misheard: …Turned to Wyatt Earp, ashamed and pale. The story: To be honest, it was a local bartender named Bill who’d misheard this lyric; to this day I regret having been unable to contain myself when he recited what he thought was the correct lyric in an attempt to have help identifying the song–I laughed out loud, right in his face, then corrected him. In retrospect, I’d rather have been more diplomatic, but, hey–it was funny. I found a lump in my left breast a few weeks ago, and I’m having pain where they found the cyst. So it was off for mammograms and ultrasounds. I got the results and talked with my doctor. I’m one of the lucky ones; my left side is clear and the right side is still just a “benign node”. I’m okay. So breathing a sigh of relief, I can grin now. Mammograms certainly don’t make you want to sing a chorus of “I enjoy being a girl.” but this day was really funny. While I stood in the room waiting, I found notes on the bulletin board that were instructions on how to run certain pieces of equipment. Nothing like seeing INSTRUCTIONS for the lab techs on how to do the tests! Not that it said “Mammograms for Dummies” or anything, but I almost asked my tech, as a joke, if she had read up on the whole thing. On the other side of the room,a sign was behind hampers for the gowns and some equipment. It said that if you could possibly be pregnant, please tell the staff. It was written in Braille on the bottom. Let me repeat the important part: the sign was BEHIND some hampers and equipment. A blind person couldn’t reach it to read it. Of course, as every woman knows, you’re asked a million different times before any test if you could even remotely be pregnant. Except when my aunt, in her 70s, had tests. They said they could skip that question. But they warm up the ultrasound gel now. Yay! Like I said, I’m really lucky. I’m okay and I’m very glad that it did turn out all right. Which is why I can laugh over these things. I went to a memorial service today for a woman who was a major part of our animal shelter. I didn’t know Harriet well; I mostly knew her from talking at meetings once a month at her house. I loved that she said her last name, Doolittle, and her love of animals meant she had to follow a certain calling, which she did. She was a veterinarian. I went today out of respect and to support the friends I know well in the shelter. I’m very glad I did; I learned a lot about this amazing woman. She started a few animal hospitals. She was a teacher, establishing a veterinary program that still exists and is creating a scholarship in her name. She owned a home along a lake that she kept as a sanctuary for many people who needed to recover in the heart and soul. She was a major, loving force in a young man’s life, including helping him go to college. You can read his tribute to her right here. She mentored people in therapy dog programs. And much, much more. Today, people from the animal shelter, her former students who now teach and heal, people who are currently students, and many friends came to remember her and talk about what an amazing life she led. In the middle of the tears and memories, one of her former students, now a vet and trainer, did the one thing missing in the memorial: they brought in dogs. They had just passed they licensing for being therapy dogs, and on the day they passed, this woman brought them to see Harriet who had helped so many people get their dogs licensed and who helped so many hurting people be comforted by dogs in this program. The dogs climbed up into her hospital bed, and she had her arms around them, enjoying having dogs with her again. Her own dog, Copper, was with friends in Florida since she had to go into the hospital. Harriet passed away that night, having had a last day that meant a lot to her: surrounded by friends, students, protegees, and pets. I firmly believe that we need to use our lives to make the world even a little better. Harriet Doolittle lived that type of life; she saw pain in the world and set herself to heal it. She made the world better and left a long reaching legacy because of it. Congratulations to my husband for his theater award! The Road Company theater group started an award ceremony this past Sunday night. The award is named after the woman who founded the group and who did so much to create and maintain its quality of good, local theater. John was nominated for Best Director of a Play. I admit that I was skeptical and thought it would be a cheesy event where people pat themselves on the back. You see Web Awards like that everywhere, people make an award to give it to each other even if they don’t deserve it. Instead, we walked into a formal dress event, catered by an excellent chef, Mirko from the Mansion in Voorhees. After a cocktail (open bar) hour, we moved into the theater for the ceremony. They had the standard categories as well as Best Volunteer, which is a fantastic way to recognize all the hours and effort people give to the organization. They also recognized that it really is true that there’s no small parts, and someone with a brief few moments on stage can capture the audience as much or more than the leads. They had video for each show, and showed them through the audience throughout the night. The presenters spoke on the importance of each category, nominee, and show. By the time I realized how seriously this was being taken, and saw who was John’s competition, I as seriously hoped he would win. He deserved to win, and I don’t say that as his wife. So many people said that to me and when they announced he won, people rose to their feet and gave him a standing ovation. Community theater is like other hobbies. It’s a passion, something you do for the love of doing it, and you try to do a great job because you love it. John has a wonderful reputation in our community. When it’s announced he’s directing a show, people send emails and call saying they’ve heard that he is one of the people to work with. They come up to him at theaters, like on Sunday night, and say they hope they get to work with him because his reputation is so good and/or they’ve seen his shows and want to be one of the people in them. I’m very proud of him. He gives theater a lot of himself and people see the results of all that effort. 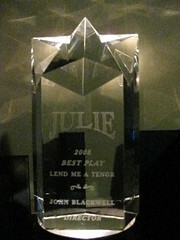 I’m also thrilled that he got this award, because it’s the one with Julie’s name on it. Julie loved him like a son; they had this loving joke between them that, with sons named Matthew, Mark, and John, he came along to be her Luke. Her grandsons call him Uncle Luke to this day. Julie and her daughter, Suzanne, were the first to support John in being a director. He trained with Suzanne and he is still one of the very few people she respects completely, and Suzanne is professionally trained. She knows what theater is. Sure, we can still joke: this and 5 bucks will get him a cup of coffee. Preferably, a Hazelnut coolatta from Dunkin Donuts. But it’s still winning an award named in Julie’s honor recognizing he does a good job. My brother lost his job – again. He first lost it when in 2000 – 2001 when President Bush gave corporations all the tax breaks to go overseas. My brother is a robotics engineer with decades of experience, but he and everyone else found themselves only able to get work at entry level jobs for years. When he visited me and heard people complaining we have too many foreigners at the coffee places, gas stations etc., he said that in his area — outside of Redmond, WA — it’s all thrown out IT people. HP people get your coffee at Starbucks. Microsoft engineers pump your gas and so on. Last year, he finally got a good job working with his robotics lines again. Places that have been using what he and the others built, need maintenance and training on these lines. A company hired them to provide those services. But in December-January, the company announced that sadly, the economy has gotten so bad, they had to lay off people. He’s scared to death. Thousands of people are competing for no jobs, he’s older now — but too young to retire — with no income or benefits. His savings have been wiped out by the previous 8 years. Unemployment won’t even see him until the end of March. On the other hand, our company’s owner has encouraged us not to give into this kind of fear, which made a lot of scared souls feel a lot better . He told us that the economy’s situation isn’t the crisis that we think it is. It’s the media — newspapers, radio, TV — creating that panic when it doesn’t exist because fear gives them what they want. There are problems, of course, but not the gas crisis, unemployment, economic panic that they say. It’s a correction, a half full glass time, when the only places laying off or closing are the ones who shouldn’t be in business anyway — companies trying to horn in on the industries like ours — or places that are poorly managed. If you’re someone who owns a company going under and you’re not poorly managed or horning in, someone like our boss, then you have to look at your employees for the blame — they’ve takend advantage of you, maybe even held you over a barrel to get what they wanted — and see if you can get rid of that problem. I didn’t tell my brother any of this, that his fears are media created and his company isn’t really affected by the economy, just an industry correcting itself, because I don’t think it would have helped. I wish I knew what I could have said that would have helped. The Princess and The Pirate King, also on Flickr. I wrote this children’s show years ago and it’s actually one of the first plays I ever wrote. The Woodbury Sketch Club Players asked me if they could perform it in March and the director made this logo. I love it! It’s fantastic! I do cringe to think of what the script is like! Whenever I read over something I did in the beginning (uh — actually, anything I’ve written), I always wish I could change it! But the director and theater group like it, and hopefully, the audience will agree! 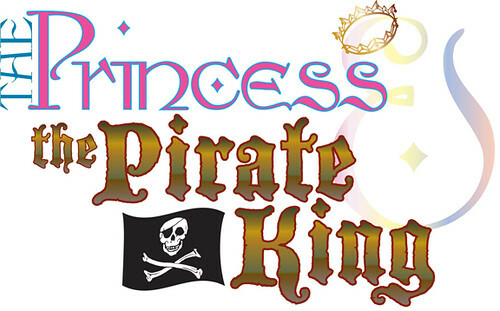 In a far away land, the evil Pirate King Corrupt has overthrown the good King Wellborne and Queen Elegant forcing them to flee for their lives. Fearing for their infant daughter’s safety, they smuggle her to their loyal subjects Fabler the Storyteller and his wife, Mocking the Joketeller. Now Princess Noble celebrates her eighteenth birthday and her Fairy Godmother returns. This day is extra special as a prophecy foretells of a champion who will aid Princess Noble in defeating King Corrupt and his henchmen, Shady and Shifty. It will take a great hero to defeat the evil King’s army, his sinister but crazy henchmen, and worse of all, the King’s Hound. When we first performed this, the title was “The Princess and the Prophesy”, but kids don’t really know what a prophesy is. It needed a better hook, so I brought up that pirates are in it (although the pirates are actually *gasp* bad guys). Casey was in the show then; I still remember John bringing her out for her bow. LOL! That and how once the kids saw her, they couldn’t care about the rest of us. ROTFL! Another group performed it a year or so later. I remember sitting in the audience and seeing the kids as they watched the show. Their faces were lit with magic. To know I gave them that…. wow. 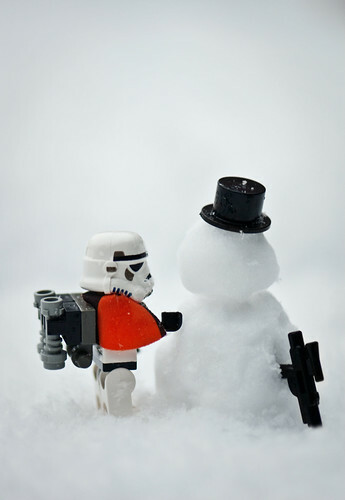 Sometimes, you just have to build a snowman, originally uploaded by Balakov. Fantastic and fun job by Balakov on Flickr!